Back for 2019 after a great opening year is Worcester Park's All Stars programme. 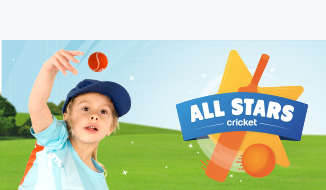 All Stars Cricket provides boys and girls from 5-8 years old with 10 weeks of non-stop fun. The activity and game-based programme is suitable for all skill levels, providing your child with the foundations to begin a lifelong love of physical activity and cricket, while making friends in a safe and enjoyable environment. In addition to the benefits from the All Stars package, the additional payment also makes you and your family members of the Worcester Park Athletic Club, and entitled to use its facilities. Course runs every Thursdays 6.30-7.30pm starting in May.  2019 Colts Registrations Now Open! Register for the 2019 Season Using Our New Registration Portal!